With the Ameise® table trolley, you can transport tools, spare parts or working materials to the desired location with utmost speed and flexibility. It can also be used as a work table when secured with the parking brakes or the (model-dependent) central brake. 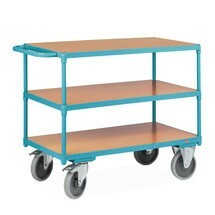 The fetra® table trolley is ideal for daily use in industrial areas. It is made from robust tubular and sectional steel and offers a capacity of 300 kg with a choice of 2 or 3 levels. 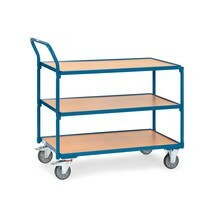 The fetra® table trolley is ideal for daily use in industrial areas. It is made from robust tubular and sectional steel and offers a capacity of 400 kg with a choice of 2 or 3 levels. 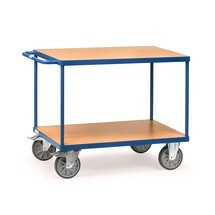 The fetra® heavy-duty table and assembly trolley is ideal for daily use in industrial areas. It is made from robust tubular and sectional steel and offers a capacity of up to 600 kg with a choice of 2, 3 or 4 levels. 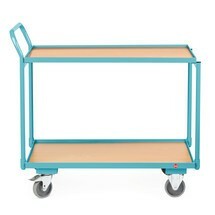 The Ameise® table trolley is equipped with a horizontal handlebar for easy handling. 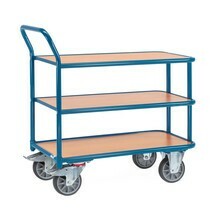 You can move your goods with ease via the handle, while the robust quality of the table trolley also allows you to transport heavier loads when necessary. The BASIC plastic transport trolley with smooth loading platforms for the secure transport of tools and goods is optionally available with 2 or 3 levels and in different colours. The BASIC plastic transport trolley made from polyethylene with base cabinet is a practical aid with additional storage space. The robust material is reusable and resistant to impact. The base cabinet is lockable. The BASIC plastic transport trolley with tray shaped loading platforms for the secure transport of tools and goods is available with 2 or 3 levels and in different colours.